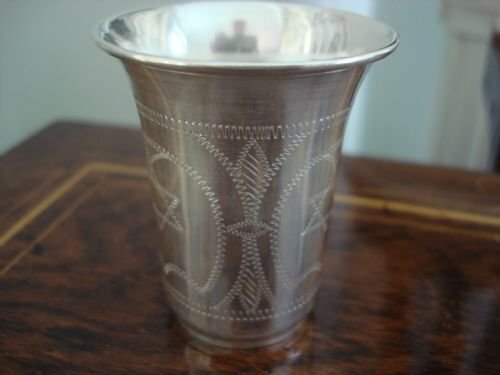 Extraordinary and very heavy solid silver hallmarked embossed Kiddush cup or beaker. 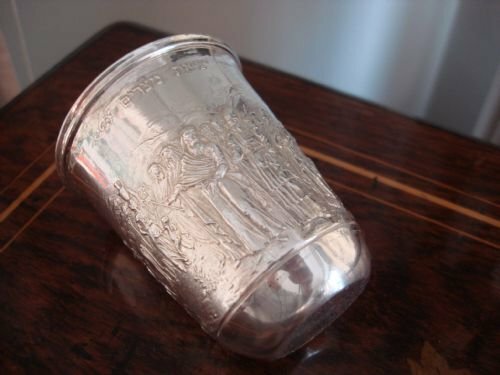 Suberb London 1994 English hallmarked solid silver extra heavy Kiddush cup superbly embossed with illustrations of Moses leading the Israelites during the Exodus from ancient Egypt as described in the Hebrew bible. The Exodus is the theme of the Jewish holiday of Passover. The relief illustrations circle around the entire perimeter, beneath a title in Hebrew text. The workmanship of the people, buildings, and landscape beyond are beautifully executed. 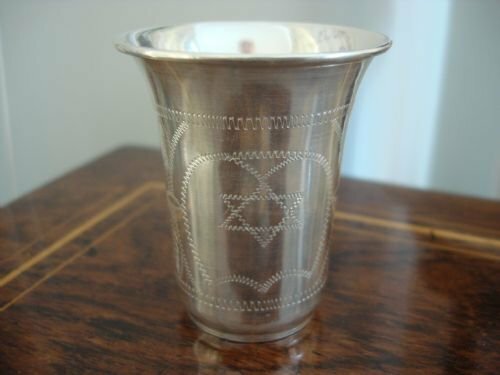 This is the centrepiece of a Kiddush cup collection. Made by Aylbury and Co. Ltd. 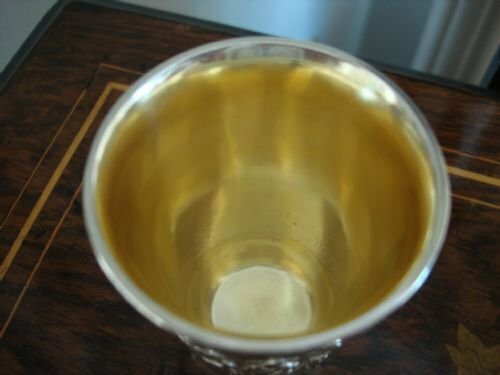 This superior quality cup is beautifully crafted with a tapering shape and rounded bottom, and has a gilded interior. 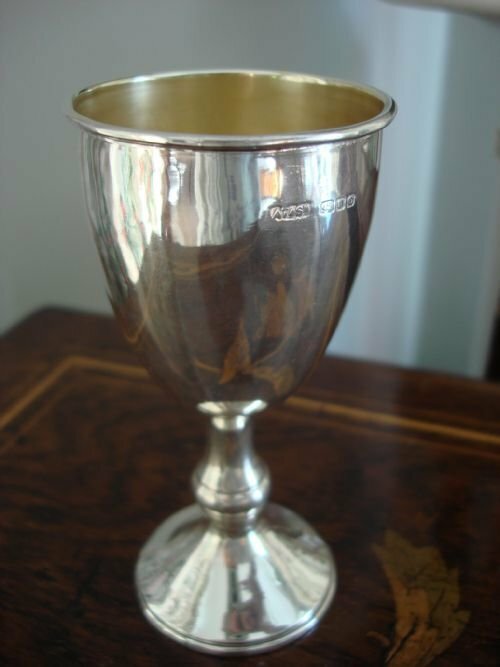 It is wonderfully tactile, made with a very thick gauge of silver, is very weighty, and a pleasure to see and hold. 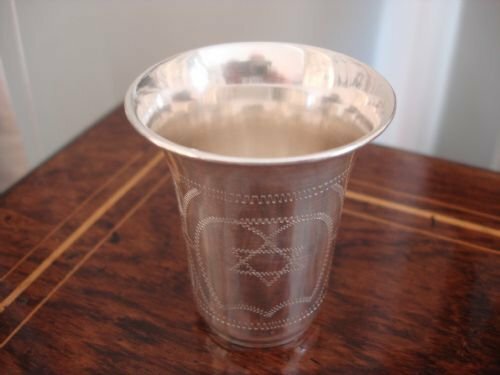 Kiddush is a blessing recited over wine or grape juice to sanctify the Shabbat or Jewish holidays. Size-2.75 inches high by 2.25 inches diameter. 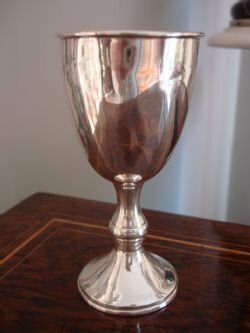 It is an exquisite piece and is in very good condition, ready to become the centrepiece of a collection, or to present to celebrate an important occasion. This one of a kind cup is the perfect gift! 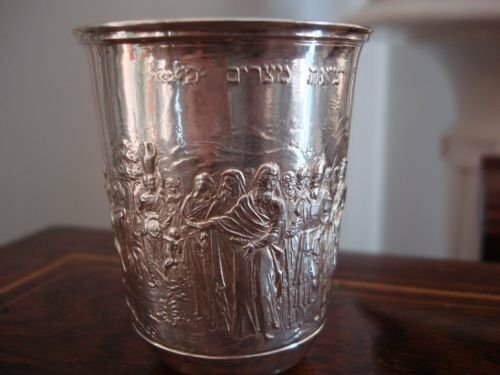 A wonderful and culturally significant piece of Jewish history to preserve, or to use to start a new tradition. 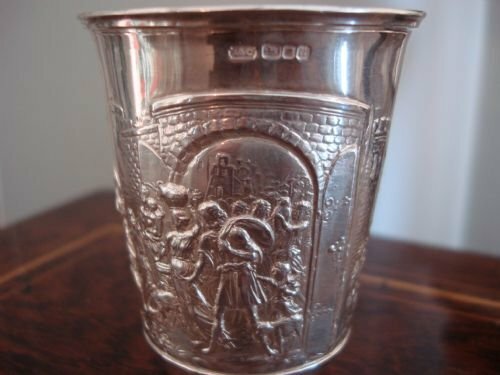 London 1949 solid silver Kiddush cup or silver goblet. London 1949 English hallmarked solid silver Kiddush cup or silver goblet with knopped stem and plain unengraved design, suitable for personalisation if desired. Made by Aaron Taitelbaum and Son. 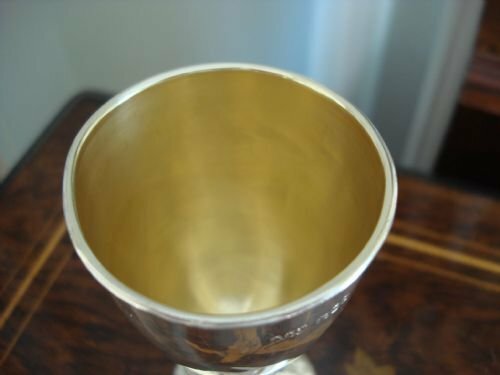 There are some line marks to the goblet and it is slightly out of round at the lip, but still quite a nice piece in good condition overall, and ready to be used. 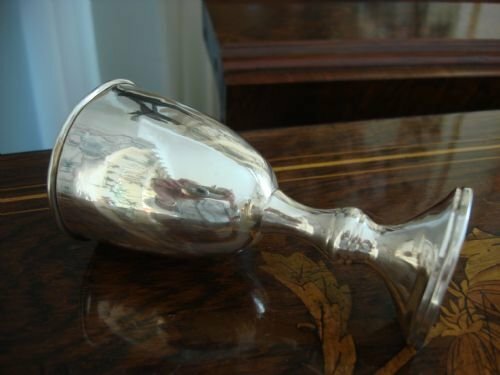 This would make a nice piece to add to a collection of goblets, or to use for important ceremonies. Please also see other Kiddush cups available at www.serpentineantiques.co.uk. 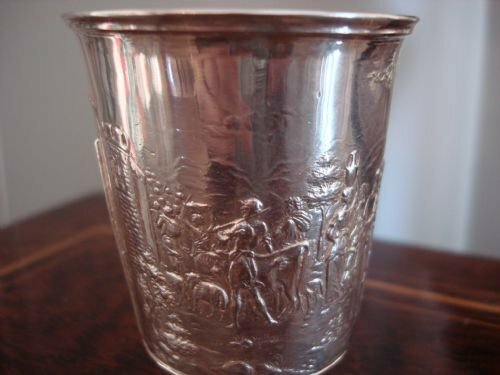 London 1922 solid silver Kiddush cup made by Rosenzweig, Taitelbaum & Co.
London 1922 English hallmarked solid silver bright cut engraved Kiddush cup made by the well regarded Jacob Rosenzweig of Rosenzweig, Taitelbaum & Co., makers of Judaic silver. 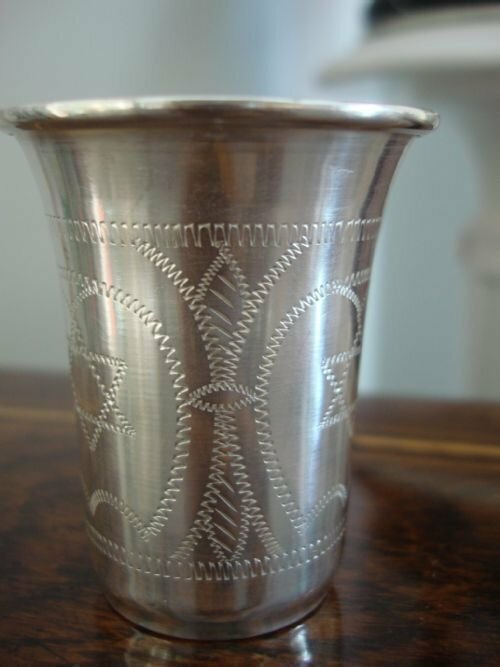 Kiddush is a ritual blessing said over wine or grape juice to sanctify the Shabbat and Jewish holidays. 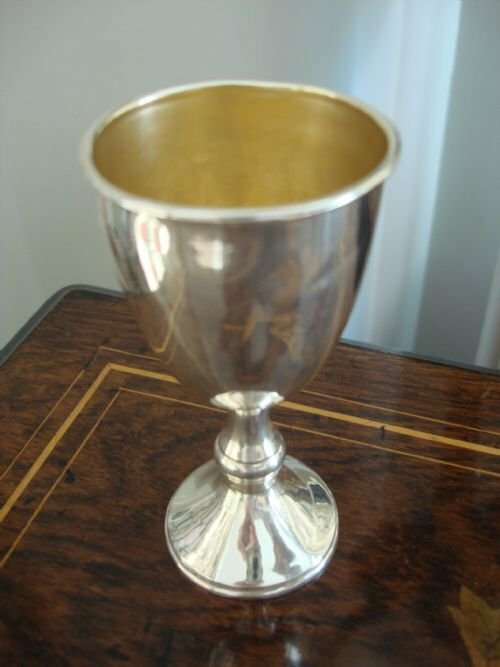 A silver cup or goblet is often used. 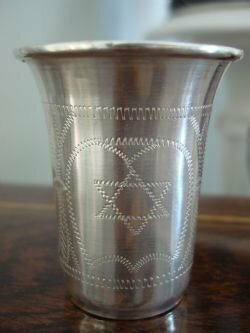 This lovely cup or beaker is beautifully engraved with the Star of David within two cartouches, leaving another one vacant for personalisation if desired. Size-2 inches diameter by 2 3/8 inches high. 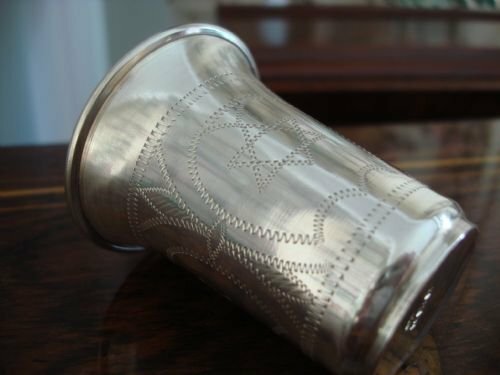 This is a wonderful antique Kiddush cup for the collector, or to use in Kiddush celebrations or give as a gift for important religious occasions. An important survivor of Jewish history to preserve, or to use to start a new tradition. 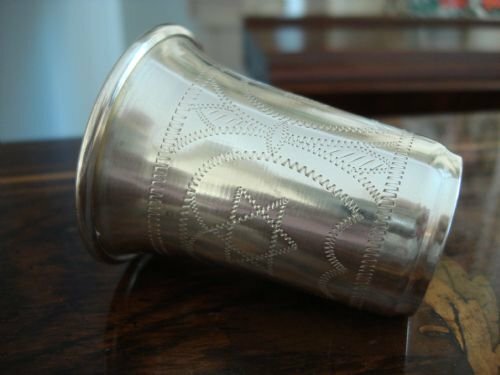 So many of these pieces of history were lost forever during the Holocaust. 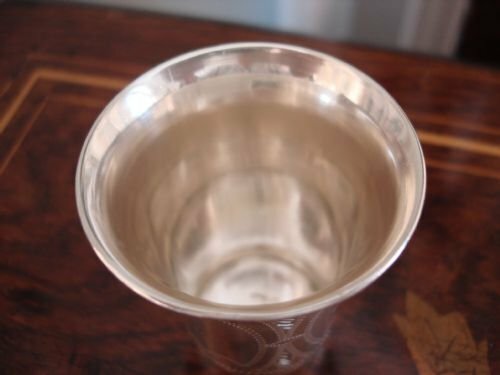 An identically designed and hallmarked cup is available if a pair is desired. See last photo. 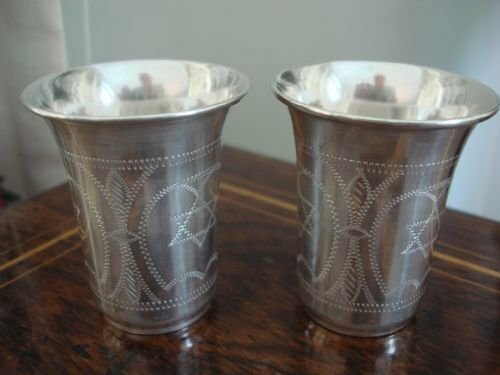 Please see additional silver Kiddush cups available on my personal site www.serpentineantiques.co.uk. 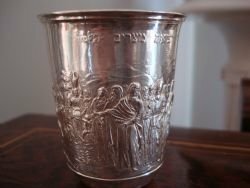 This is a wonderful antique Kiddush cup for the collector, to use in Kiddush celebrations, or give as a gift for important religious occasions.